Look no further for your ideal waterfront retreat than this peaceful 2-bedroom, 2-bathroom vacation rental home! Located in a quiet North Liberty cul-de-sac along the Iowa River, this home accommodates up to 8 guests. Enjoy a beverage out on the viewing deck or roast s'mores at the outdoor fire pit with family and friends. Visit a more urban landscape with a short 20-minute drive to downtown Iowa City for a Hawkeyes game or tour of the Old Capitol Museum! Discover the diverse terrain of North Liberty while staying at this cozy home. Enjoy limitless views of Lake Coralville and the Iowa River from the furnished upper viewing deck or adjacent screened-in porch! Gather around the fire pit as you keep your eye out for local wildlife such as deer, turkeys, and bald eagles! When you want to relax inside, grab a seat in one of the plush recliner chairs in the main living space to catch up on the news using the flat-screen cable TV. The fully equipped kitchen boasts stainless steel appliances, copper slate tiles, and a cozy breakfast bar with seating for 3. Share your meals at the bamboo glass-topped table or choose to dine al fresco on the deck. On cooler Iowa evenings, head downstairs to use the timeless brick wood-burning fireplace found in the second living space that also features a flat-screen cable TV and access to the covered patio. Settle in for the night in one of the 2 spacious bedrooms that offer 1 queen bed and 1 full bed, each with plenty of closet space to host your entire wardrobe. Don't forget to utilize the pullout sleeper sofa for additional sleeping arrangements! You're sure to enjoy the winding views of the Iowa River from this scenic property. When you want to be out on the water you can easily rent a watercraft from Coralville Lake Marina, 10 minutes from the home or Scales Pointe Marina, only a 15-minute drive from this home. Satisfy the history buffs with a trip to the seven villages of the Amana Colonies located a 30-minute drive west of this property. Settled in the 1850s, these unique villages deliver historic mid-western charm paired with modern shops, cafes, and restaurants suitable for all ages. Visit the downtown Hancher Auditorium, University of Iowa, performance hall hosting Broadway musicals, contemporary dance & classical music. Opt for a post-millennial urban landscape when you take a 20-minute drive into downtown Iowa City. Attend a Hawkeyes game or tour the University of Iowa campus before dining at a gourmet restaurant near the Old Capitol Town Center. We booked the cabin for the weekend to see our daughter who is a student at the University of Iowa. All together there were 5 of us there and we all loved it. We were able to hangout together, cook, watch tv/movies & play games. The cabin is very nice, very clean as well. The view of the Iowa River is great, very relaxing to sit on the deck and take it all in. We will book it again for future visits. 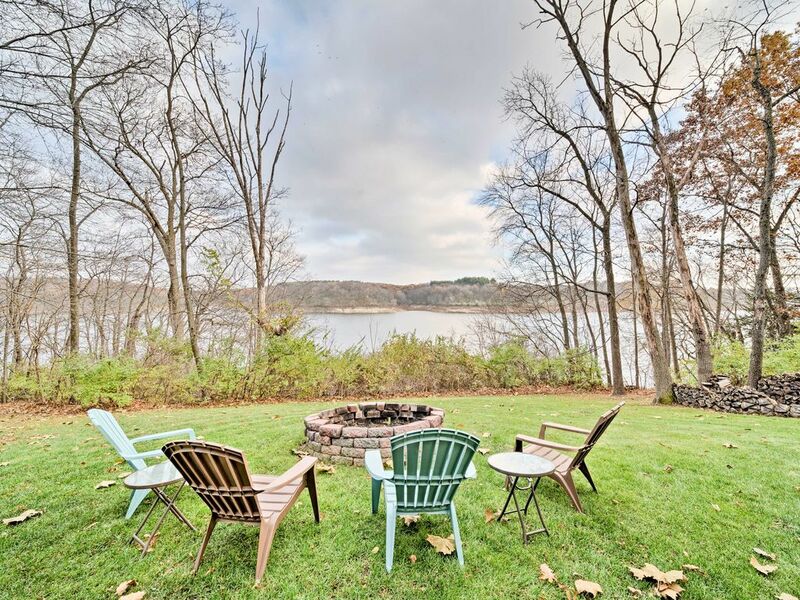 Quiet place, amazing views and perfect layout for an Iowa getaway. This property was exactly what we expected and was a perfect getaway. The home was very clean and had everything we needed. The privacy was great, the views were amazing and the general layout of the home was perfect for us and our 3 Great Danes. We also had 3 other adults come and stay for a couple of the days and we all had plenty of room. The home is very cozy!! Our dogs loved running back and forth in the screened in back porch. The only thing that was a negative for us was our large dogs would not use the spiral staircase so we had to bring them in and out of the basement from the walkout sliders. Thank you to the Owners for a wonderful and memorable stay! My family and I absolutely loved our stay at this property. The house was the perfect size and had everything we needed. The view was fantastic! Would definitely recommend this property! exceptional home on the water. Great location! Fall visit to North Liberty. We (two couples) enjoyed our stay at North Liberty and found the home clean and well suited for our visit. The weather was on the cool side with rain on a couple of days. The river was high and was relaxing to watch from the deck or the rooms on the east side of the house. The area around the property was very quite even though there were neighbors on two sides of the house. The location is good if you are looking to relax and get away from the city. The town of North Liberty is close as is Solon. There are numerous restaurants in both towns. One thing about the home it has several steep steps leading from an upper parking area to the house, this was not a problem for us but would be for anyone using a walker or wheel chair. There are also stairs from the first floor to the second floor (see pictures of house interior) otherwise you can use an outside entry.